Moscow court overturns seizure of Mari El ex-head’s assets | Russian Legal Information Agency (RAPSI). MOSCOW, August 21 (RAPSI, Nikolay Merkulov) – The Moscow City Court has overturned a lower court’s decision to seize the assets of ex-head of Russia’s Mari El Republic Leonid Markelov charged with receiving a large-scale bribe, RAPSI reports from the courtroom on Monday. On July 10, the Basmanny District Court of Moscow seized Markelov’s ownership interest in six companies. Lawyer of Markelov, Irina Gritsenko, said in court that the seizure of assets caused damage to the companies’ activity. According to the Investigative Committee, the probe was opened into Markelov and other persons in relation to alleged reception of bribes, giving a bribe and mediation in bribery. Investigators believe that Markelov has received a 235-million-ruble bribe from the head of Akashevskaya factory Nikolay Krivash for patronage and assistance in the property payment of funds provided by state support for development of the agricultural complex. Markelov’s accomplice, head manager of Telecompany 12 Region, Natalia Kozhanova is charged with mediation in bribery. Markelov pleaded not guilty to receiving the bribe. According to the ex-head of Mari El, investigators are confused regarding figures related to the transfer of money between companies and individuals. 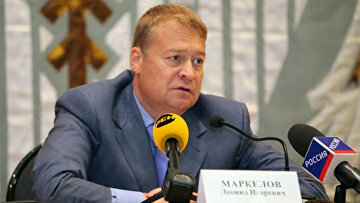 Markelov insisted that financial relations between the companies were related to the construction of a large agricultural holding. Former head of the region called himself a “lobbyist, in a good sense of word” who managed to “attract 370 billion rubles ($6.4 billion) of investments into “the dead region”. He added that he could not influence transfer of government subsidies to the Akashevskaya factory. On April 6, Russian President Vladimir Putin has accepted voluntary resignation of Markelov, who was governing the region for 16 years. 13:37 21/08/2017 The Moscow City Court has overturned a lower court’s decision to seize the assets of ex-head of Russia’s Mari El Republic Leonid Markelov charged with receiving a large-scale bribe.